Helloooooo, and the warmest of beardy welcomes to my little hirsute blog. Today I present to you my Q&A with author Seth Lynch. Seth is the brains behind the wonderful, and I do mean wonderful, period noir Salazar novels, A Citizen Of Nowhere and A Dead American In Paris (click titles for reviews. There is also a non-Salazar 30s Paris book, The Paris Ripper, featuring Chief Inspector Belmont, but I have yet to read that one. The book sits on my shelf crying at me 😥). How did you come up with your idea for Salazar from A Citizen Of Nowhere (ACoN) and A Dead American In Paris (ADAiP)? For ACoN I wanted Salazar to come to terms with his past. I don’t believe that anybody really ‘survived’ the First World War. The ones who came home, the Lost Generation, had to deal with what they’d seen without the help of modern mental health: if you couldn’t cope you were week willed. Many committed suicide and Salazar could easily have gone that way. With ADAiP I already had the main characters and felt more confident in what I was doing. I started off with a few ideas but the main theme came after reading an article about women in Guatemala being jailed because they’d had a miscarriage and couldn’t prove conclusively that it wasn’t an abortion. TBBB: Chief Inspector Belmont appears in his own book, The Paris Ripper, as well as the Salazar series. Who came first and will be seeing Inspector Belmont in his own series again? SL: I originally wrote a first draft of Salazar #2 and then a very quick first draft for Salazar #3. When I finished, I wasn’t too happy with either #2 or #3 and thought it would be easier to get a new publisher (my old publisher had gone under) if I gave them a new character, so Salazar #3 became Belmont #1. This involved a complete re-write, but it was made a little easier I’d written #3 in the third person. Once that was complete I had a fully fleshed out Belmont and a developed police team, so when I went back to re-write #2 I found it a lot easier to write about them. When I rewrote Paris Ripper I wanted to try and write it like a Jo Nesbo book. Something must have gone awry with that plan. Chief Inspector Belmont first appears in A Dead American in Paris. Paris Ripper is his own show. I’d like to write another Belmont book, but I’m not sure if I will at the moment. TBBB: Oooh, go on! You know you want to 😉 Was he, or any of your other characters, based on anyone you know? If so do they know? SL: None of the characters are based on people I know, but the character of Tony in ADAiP is based on Henry Miller. TBBB: If you could be any character from your books who would it be and why? SL: None of them have particularly happy lives. It would be nice to be Salazar, until you remember that his life up until the first book was pretty traumatic. Belmont is rich and enjoys his work, but he drifted apart from his wife because they couldn’t reconcile themselves to the loss of their son. Even Filatre, who is quite content, lost his wife and suffered from depression as a consequence. I guess noir doesn’t produce happy lives. I’m still tempted to say Salazar, even though the Nazi’s will be arriving in Paris in a few short years. TBBB: Salazar has PTSD from his experiences in WW1 and over the course of the two books (A Citizen Of Nowhere and A Dead American In Paris), he undergoes a change from a man who acts first with his fists and thinks later to becoming much more of a pacifist. Was his character arc something you had planned all along or did it grow organically from the story? SL: That was the only part I had planned. It’s easy to respond to violence with violence and I didn’t want to make life easy for Salazar. I felt that a man who’d been traumatised by violence could either wallow in it or rebel against it, and Salazar is a rebel. I also wanted to find the point where that position of non-violence breaks down. It would take an unusual person not to react violently in any situation at all: for example, do you hit this person over the head with a rock or do you let them kill your child? That one’s easy but it gets interesting if you start taking it back until you get to hitting people over the head because they might make you miss the bus and arrive ten minutes late for work. In-between those points there has to be a cross-over where the rock hitting becomes an actual dilemma and I wanted to push Salazar’s cross-over as far along the line as possible. SL: The novels are my interpretations of real life passed through a lot of lenses. Not a lot of it is based on my life, for which I’m very thankful! I am a vegan and a pacifist, but I started out as a meat eater who got into a lot of fights at school. This part of Salazar’s life is similar to mine. TBBB: How long have you wanted to be a writer? What was it that finally spurred you on to do it? SL: I’ve probably always wanted to be a writer, but the form of the writing changed over time. At 17 I wrote terrible poems heavily influenced by Bob Dylan songs. Then I wrote short stories which were meant to be humorous but weren’t good. I’ve always read a lot of novels so it felt natural to try my hand at it. The first few attempts were terrible. I had so many ideas I wanted to develop but it took a few years and a lot of false starts to write without the sermons and cod-Surrealism. When I started on Salazar in earnest I read as many crime novels as I could along with a clutch of How to Write books. TBBB: What does Fahrenheit Press and Fahrenheit 13 mean to you? SL: I’m going to apologise for this terrible analogy right now (I’m sorry) but Fahrenheit Press is the whore with a heart of gold. Fahrenheit’s public persona is of a hard hitting, take no prisoners, punk-rock rebel rouser. It’s true too, but underneath there lurks something caring and compassionate. It means something to work with a publisher whose values are aligned in some way with my own. I also believe that small presses are essential. I feel there’s a certain amount of fear, coupled with an overwhelming desire to publish best sellers, which stifles the larger publishers. At one point it felt as if every agent had on their bio page: I’m looking for an original voice, just like the one in Gone Girl. The truly original voices are, for the most part, found in the small presses. TBBB: Is it important to you to be published by an indie press? SL: I won’t lie, I’d rather be published by one of the big presses, but my reasons a purely financial. I’d like to earn enough money to write full-time, or at least go part-time at work. That’s not going to happen with a small press. I do like being part of Fahrenheit and I do like the ethos of many small presses – these guys and gals are doing it for the love of books. Nobody is going to get rich through the small presses, not the author and not the publisher. I think the publishing world as a whole would be a lot healthier if the larger publishing houses started looking at the small presses as places to incubate talent. I’d like them to fund the smaller presses in much the same way a Major League Baseball team has relationships with lower league teams. They could may for some of the marketing and distribution to get the books into the shops. If one of those books then takes off, they can up the writer to the big publisher squad. A certain percentage from the profits of those books can go back to funding the relationship with the smaller press. TBBB: What does your writing day involve? Do you have any routines or writing superstitions? Those things that you just have to do? I have two daughters aged 10 and 12. They go to various clubs in the evenings, I take them then sit in the café and write. That gives me an hour most evenings. I type up anything I’ve written the next day – it has to be quick as my hand writing is so terrible that I can’t read it after about 24 hours. TBBB: Are you a plotter or a pantser? What are your favourite kind of pants? SL: Until recently I would have said 100% pantser. It’s now dropped to 98% (all numbers a highly unscientific). I start with a series of scenes in my head and I try to join them through the writing. This method is incredibly slow, the first draft is actually long and detailed synopsis and I have to do a lot of re-writes. I’m currently working on a novel where I’ve decided that each section will have a certain number of words. It’s really vague as the sections have simple descriptions like: Later Summer 1935. There are about six main characters and they each have a chapter in every section. Then, before working on a section, I make notes at the top of the empty chapters, simple stuff like: ‘there will be a conflict in the band, some will join Angelo others will not.’ There’s not much more to it than that, but when I come to write I find having those notes gives me a direction for that writing session. In my head I have the story endings for each of the characters. My favourite kind of pants? I’m going to go for the American version of pants and say cords. TBBB: Do you plan ahead several novels in advance or purely book by book? SL: I try to concentrate on the single book I’m writing, but before the first draft is complete other ideas will start bubbling up. I ignore all the ideas until one persists and that will, usually, become the next novel. I have a vague idea of how all the French novels (Salazar, Belmont, and there’s another in the pipeline with Fahrenheit called Veronique featuring a retired detective called Ronin) will tie up, but in the meantime I’m writing something that has nothing to do with crime or France. The idea persistently bubbling at the moment is a book based on Emperor Nero. I like the idea that history has already laid down the main events of the story. TBBB: Your books are set in Paris in the 1930s. Why did you choose this era and city? The Paris in your books is beautifully and evocatively realised – how much research do you undertake before starting to write or are you secretly a time traveller? SL: I’ve been interested in 1920s/30s Paris for about 30 years. Around the age of 18 I started reading Henry Miller’s novels; Tropic of Cancer, The Rosy Crucifixion, and his free and easy life seemed pretty attractive to me. At the same time I read a History of Surrealism by Maurice Nadeau. From that I realised that Surrealism started as a literary movement and I began reading their novels and poems. Then I started in on Hemmingway, Camus, Sartre etc. Along with the books I’ll watch any films made or set in that period from the excellent French films of the time to movies like Midnight in Paris. I do do some specific research but not too much. I’ve read a lot of straight history books on the time and also looked over archived newspapers sites (I can’t speak French but I can read enough of a newspaper headline to get the drift of the story). I’m constantly surprised at how similar things are in the past with today, more so than by the differences. We tend to think of people from different places, geographical and historical, as being different from us. I’m not sure that’s true at all. I think if you swapped, at birth, a modern day Brit with anyone from any other period of time, they would fit into that society just as if the swap hadn’t taken place (ignoring shades of skin colour). I think this would be true going back hundreds of thousands of years. When you start thinking of people as having universal desires and hatreds it becomes easier to imagine how they’d behave, all that changes are the fashions. TBBB: Both A Citizen Of Nowhere and A Dead American In Paris have wonderful covers evocative of the era. How important is a good book cover to you? SL: As I’m not a known writer I suspect the cover design plays a large part in a person deciding on whether or not to buy the book. That and the support of bloggers like yourself and people writing reviews on Amazon and posting in social media. Readers have a lot to choose from and you need them to stop for a second, as they browse past your Amazon listing, to read the brief summary of the book. The title and the cover (and as they gain rep, the publisher’s name) are all I have to make them stop and look. TBBB: Which do you prefer: eBook or physical book? What do you think are the pros and cons of each? SL: I like having physical books on my shelves, but I now prefer eBooks. I like to read in bed and holding up a large novel can give you arm ache. I also underline when reading (odd words or interesting phrases) and a kindle is perfect for that. With my physical books I underline then fold down the corner of the page to find that note again, but only if I have a pen to hand. Also, those bookshelves of mine a pretty full, a lot of my books end up in the charity shop as I don’t have the space for them. That’s also the biggest black mark against eBooks: you can’t just give or lend them to someone else. TBBB: Tea or coffee? If tea, milk first or last, if at all? SL: Black coffee, no sugar. In the afternoon I switch to tea. Milk for me is soya milk and it goes in last. My partner, Isla, once, for some very contrived reason, went to a garden party at Buckingham Palace. She got a rollicking (in a formal way) from the ladies serving tea because she put the milk in first. I suspect that rollicking a guest is a bigger faux-pas than putting the milk in first. TBBB: Favourite biscuit? Or are you a cake person? SL: Unfortunately I can’t eat wheat as it gives me a stomach ache for hours afterwards. Fortunately my partner and youngest daughter are good bakers so I do get home made Gluten Free cakes. On that score I’ll go for cake. TBBB: What’s your favourite shade of white? TBBB: Have you any pets? SL: No. My daughters are allergic to both cats and dogs. They are also asthmatic which makes having the rodent in a cage a problem. TBBB: Silk or cotton bed sheets? SL: I’m a vegan so don’t use silk, but I don’t like silk as I really hate the feel of it. It’s the same with dry cardboard, I find them both repellent. Whereas I do like the feel of cotton, especially if it’s 100% cotton. TBBB: Bath or shower? If bath: bubble bath or bath bomb? SL: I have a bath once a year whether I need one or not and when I do it’s a bubble bath with a book (here the physical book has the edge over an eBook). For the rest of the year it’s showers and – this is a sad confession – I have waterproof Bluetooth headphones, so I listen to talking books and podcasts in the shower. TBBB: What was your favourite toy as a child? Or even now? SL: My guitar, which isn’t a toy so hands off! I was always into sport so my favourite toy when younger would have been a football. I used to love my eagle-eyed action man but I left him in the front garden one night and he got nicked (although eagle-eyed he must have been a heavy sleeper). TBBB: My favourite TV show as a kid was the Six Million Dollar Man. I used to spend a lot of time pretending to be Lee Majors/Steve Austin and wishing I was actually bionic. What was your favourite TV show growing up? Did you have any heroes you emulated or wanted to be? SL: Snap! I once jumped down the stairs thinking my bionic legs would save me. They didn’t. I probably learnt a valuable lesson that day, but a heavy blow to the head meant I forgot what it was. A childhood love shared by Seth, Ian Patrick and myself. Even this photo stirs the old nostalgia glands in ways I had almost forgotten they could be stirred. 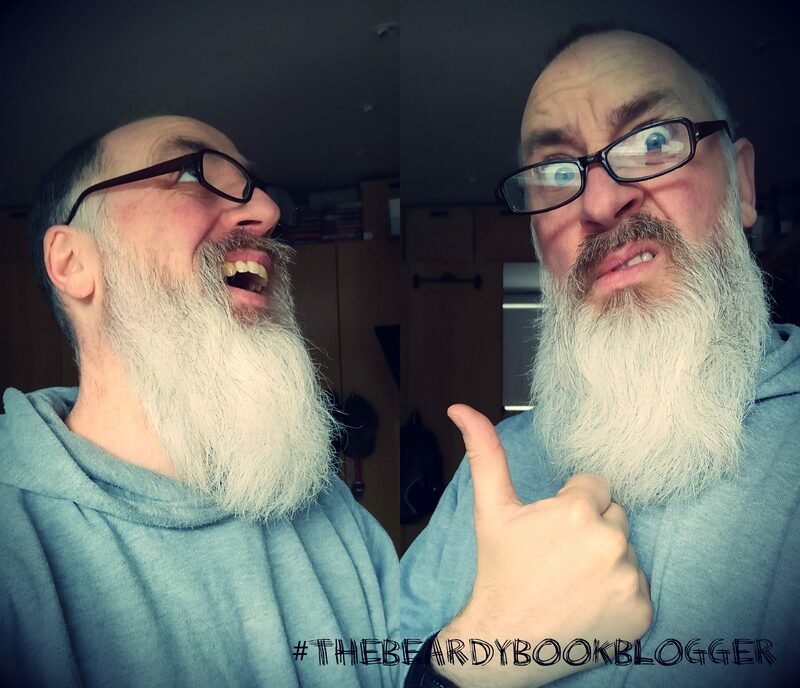 As you know, this is the Beardy Book Blogger, so, if you were to grow a beard, what style and colour would it be? SL: I work from home and I’m lazy so I normally have a week’s worth of beard growth (I’m not sure of the maths behind that.) From a distance it’s dark. Up close it has every colour from ginger, to blonde, dominated by black with patches of the purest white (grey). TBBB: Finally, if you could have any superpower what would it be and how would you use it? Would you be a superhero or a supervillain? SL: This is one the kids ask now and then. My answer fluctuates from flight, to instantaneous teleportation, to invisibility or breathing under water. I wonder if supervillains see themselves as villains, I suspect they think of themselves as goal focused individuals with plenty of drive, determination and ambition. I’m going to opt for a mind reading superhero, but I will be pocketing any reward money. TBBB: My most sincere thanks to Seth for taking the time to answer my questions so thoroughly. Cracking stuff indeed.